Normality occupies a central place in probability and statistical theory, and a most important class of stationary sequences consists of those which are normal. Their importance is enhanced by the fact that their joint normal distributions are determined by the mean and the covariance structure of the sequence. 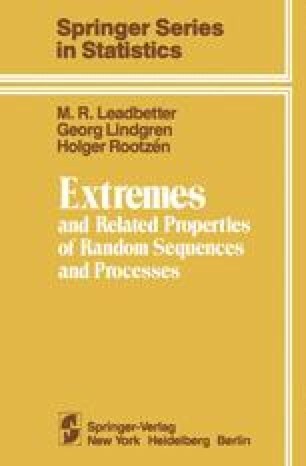 In this chapter we investigate the extremal properties of stationary normal sequences. In particular covariance conditions will be obtained for the convergence of maxima to a Type I limit, both directly and by application of the general theory of Chapter 3.